Whistleblower John Kiriakou, a former CIA veteran recently released from federal prison for disclosing the agency’s torture program, says the federal government recommended he not work for a Washington think tank on account of his goal of prison reform. Kiriakou tweeted Wednesday that the federal Bureau of Prisons (BOP) -- a subagency of the US Department of Justice that is responsible for operation of all federal prisons, including the one Kiriakou served time in -- said it was “inappropriate” for him to work at the Institute of Policy Studies, a social justice think tank located in Washington, given his stated desire to work for reform of the US prison system. BOP says "inappropriate for Inmate Kiriakou to work at @IPS_DC" because I'd might comment on prison reform. Never heard of First Amendment?? Kiriakou was a 14-year veteran of the CIA who was sentenced to 30 months in federal prison over his decision to reveal details about the CIA’s post-9/11 torture tactics to the press, a disclosure that also leaked the name of a covert officer. His sentence began February 28, 2013, at the Loretto Federal Correctional Institution near Pittsburgh, Pennsylvania and will officially finish in August 2015. He is serving house arrest after his release from prison in early February. The federal government’s policing of Kiriakou’s employment during his current period of house arrest comes at time of dire financial straits for the whistleblower. A legal defense fund was organized to help Kiriakou and his family -- a wife and five young children -- pay down legal costs that are said to be more than $1 million. “John and his wife and five children are facing ruin,” the fund’s website says. “The government’s decision to target him was designed to destroy his career, his reputation and ability to provide for his family, and thus to chill future disclosures about CIA interrogation programs by anyone. Kiriakou has said his wife was a “highly decorated, highly respected CIA officer,” but she was fired upon his arrest. “She was really going places, and far smarter and more accomplished than I ever was,” he told Democracy Now. 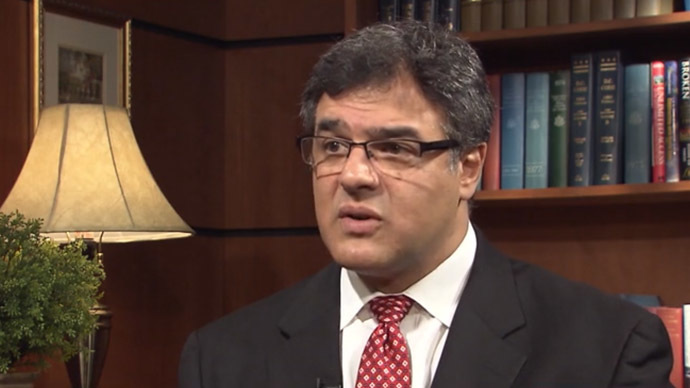 Kiriakou first revealed details about the CIA’s torture program – such as the agency’s use of waterboarding – back in 2007, during an interview with ABC News. He was the first official with direct knowledge of the program to discuss the program in public. The criminal investigation that eventually led to Kiriakou began in 2009, when government officials learned that defense lawyers for high-profile Al-Qaeda suspects at Guantanamo Bay, Cuba, were identifying witnesses to their clients’ interrogations while in CIA custody. The lawyers wanted to make the case that the government tortured their clients, and wanted someone involved to testify. During an FBI investigation, authorities discovered that back in 2008, Kiriakou had told a journalist the name of a covert CIA officer involved in the interrogations of the Al-Qaeda suspects. The journalist then disclosed the covert officer’s name to a researcher working for a lawyer at Guantanamo. With the name of an officer involved in the torture program in hand, Guantanamo lawyers were able to name the officer in their lawsuits. News of this leak led to an uproar within the CIA, which filed a crimes report. The case cleared defense lawyers and the researcher of any wrongdoing, but Kiriakou was indicted in 2012 on one count of violating the Intelligence Identities Protection Act, three counts of violating the Espionage Act, and one count of making false statements. He agreed to plead guilty to the IIPA violation last October – the first successful IIPA prosecution in 27 years. Defense lawyers argued that Kiriakou’s actions – giving a journalist the name of a former CIA officer alleged to have taken part in waterboarding – were those of a whistleblower. As a CIA officer from 1990-2004, Kirakou led an operation that captured Abu Zubaydah, a suspected Al-Qaeda facilitator in 2002. Zubaydah was subjected to waterboarding – simulated drowning – 83 times during interrogation, according to CIA records. While he was convicted for leaking the name of a covert officer, Kiriakou said he was really being targeted for revealing the torture program to the public.